Robert Mercer of Newfoundland, Canada is a 74 year old male who had a heart attack at age 42 in 1982 and a mild stroke in 1985. Imaging at that time confirmed a 100% occlusion of the right carotid artery and a 27% blockage of the left carotid artery as well as further coronary artery disease progression necessitating bypass surgery which was performed not withstanding a 100% occluded right carotid artery. Despite optimal medical therapy and modest nutritional changes of decreasing sugar, fat, and eating less meat, the patient’s left carotid artery blockage had progressed by 2008 to 80-90% occlusion by ultra sound. 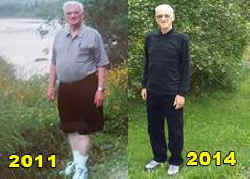 By 2011 he was having daily angina and his physician indicated there was nothing further they could do for him. He felt his time was short. During this time, Mercer’s daughter had found and read Dr. Esselstyn’s book Prevent and Reverse Heart Disease. She herself had experienced a heart attack at age 37, so they both became fully committed to whole foods, plant-based nutrition. Within one month, his angina completely disappeared and his erectile dysfunction resolved. After 4 months, he had lost 41 pounds to a body weight of 136 pounds which was the same weight at his wedding 53 years earlier. In September of 2013, a repeat duplex ultrasound confirmed left carotid artery disease reversal from 80-90% in 2008 to 50-69%. Mercer states he no longer tires and in retirement he is physically active all day.